By the end of this article you will have discovered how to easily write a Restaurant Marketing Plan. This is an essential document both for designing a new opening business plan, or to revitalise your existing one. Whether you wish to open a new restaurant, or spruce up an existing one, having a well designed marketing plan is crucial for the success of the business; regardless of it being a cafeteria, small restaurant, pizzeria or anything else. By ‘crucial’, I mean literally, as really you have no choice. Your business plan must include two critical factors if you want to stand out in the crowd: firstly, a well studied marketing strategy; and secondly a detailed plan. Look at it this way: you may have the best soldiers on the planet, but without a winning plan, the risk of slaughter is inevitable. In reality, a ‘one-size-fits-all’ marketing plan simply doesn’t exist, so it’s pointless searching on Google to find, for example, a “Restaurant Marketing Plan” or “Pizzeria Marketing Plan” in order to copy and paste someone else’s ideas. Successful strategies adopted in other restaurants may, unfortunately, lead yours into bankruptcy. The key to success is hidden in your own mind, and not in a PDF produced by someone else. After all, they don’t understand anything about your business – only you do. That’s why you don’t have a choice. What you do have is a system whereby you learn a method, reflect on your own business, and use the right tools. Be prepared to do some in-depth thinking, and to chart your own course. If all that sounds too daunting, don’t worry – I’ll teach you the perfect method to write your own marketing plan. First, let me reveal the must-have tool in writing a killer Restaurant Marketing Plan. Developed by the successful team known as Palo Alto Software, it is an amazing computer program that will help you create a Restaurant Marketing Plan that works – instantly! Visit the official site to learn more about Palo Alto Software and how it can help you. 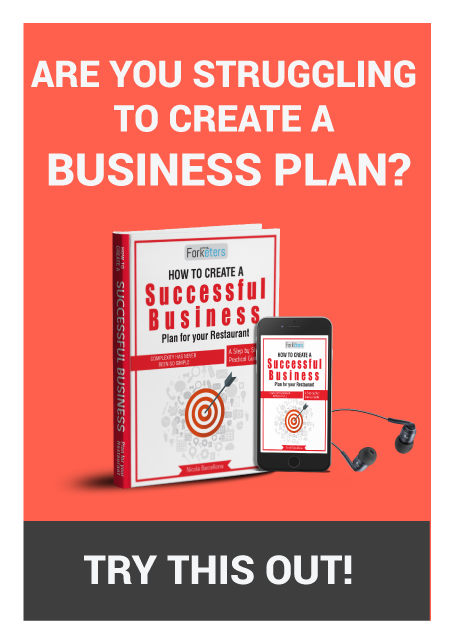 Before starting to write your Restaurant Business Plan (whether a new opening or to upgrade your restaurant), you will have done the background preparation. This involves having a good think about who your intended customers are, and what distinguishes them from others. You would have then applied your findings by conducting an analysis of your competitors and target customers, to identify if there is a space in the market. The next step is to convince potential customers that your food and services meet their needs. You can achieve all this through an effective marketing strategy. An effective marketing strategy is the winning weapon in this competitive arena. It dictates the time and method employed to the sale of the product or service. Before going into any further detail, I want you to have a clear understanding of the concept of marketing. There is too much confusion around this term, so let’s shed some light on the matter. Marketing is a business function aimed at targeting the needs and unsatisfied desires of the consumer. It achieves this by defining and assessing opportunities, determining which markets to target, then selecting appropriate products and services to satisfy those markets. Marketing involves establishing, maintaining and strengthening relationships with consumers and stakeholders to achieve goals and reap profits. The main function of marketing is to explicitly respond to the needs of consumers. Marketing activities allow you to learn more about your potential customers, and gain better understanding of business trends and competition. Furthermore, they will enable you to focus on the more profitable markets only, thus making you more effective in the commercial field. Now let’s look in more detail at Restaurant Marketing. As you can see, the key word here is ‘right’. Marketing is not just about advertising. It is a complex and deep-seated process, beginning at the core of your business; so it entails far more than simply shouting about how good your food is from the rooftops! Carrying out marketing, in this case, means serving your food (or providing your service) in the right location (where potential consumers reside), and communicating with those probable customers using the right means. Opening a Facebook page, creating a website, distributing leaflets to every house within the vicinity of your restaurant and so on, is just the tip of the iceberg when it comes to the full process of marketing! The modern restaurant industry can no longer exclude marketing in its day-to-day activities. From fast food chains to traditional restaurants, whether managed by corporate groups or individual owners, the use of marketing techniques is increasingly gaining importance. The risk of not utilising marketing techniques is to be cut off from the market. It’s true that there are a number of restaurant owners (at various levels) who completely ignore marketing, and appear to live – even thrive – for a long time. But the difference between them, and those who focus on marketing techniques, is like comparing a sailor with a captain. The former knows how to negotiate the course, while the latter merely directs the route. No activity that considers itself entrepreneurial can fail to take advantage of marketing techniques. In the hospitality industry (of which restaurants are a part), the application of these techniques is particularly important, due to the nature of the business. In manufacturing, for example, a product is created, sold, and feedback from customers is generally sought and received. By contrast, in the catering industry the product is ‘packaged’ and almost simultaneously consumed, often on the same ‘site’ (premises) as production. The main features of the latter are of a dual nature, comprising the product on the one hand and the service on the other. One aspect is ‘tangible’ (product), and the other ‘intangible’ (service). This is a prominent element which illustrates an important difference between manufacturing and hospitality industries. Therefore, marketing techniques are vital to the success of any restaurant business. As a manager you should be able to handle factors varying in nature, but closely related to each other, to ensure the ultimate success of the business. If you feel a little uncomfortable with the main concept of marketing, I recommend reading this book about marketing for beginners. There are several strategies that can be adopted; however, some of them are the fundamental cornerstones of any restaurant marketing plan. Firstly, assuming that the catering industry is a high density of human capital, your staff must be well trained and chosen with great care. Weeks, even months, of effort on your part can be undone in minutes due to poorly trained, or poor quality, staff. Secondly, the working environment is of utmost importance. Creating and maintaining a suitable workspace is critical in the success, or failure, of the company. Many factors must be taken into account, from the tangible (such as decor, setting, cleanliness, lighting, staff uniforms etc.) to the intangible, for example feeling a sense of security and well-being. Thirdly, you should take as much care of your image online (when using social networks and the like) as you do in ‘real life’. Not being present on the internet is bad enough, but worse still is having a poor image – this will lose you customers on a daily basis! It is clear that marketing is a commitment that applies to several areas of your business. So without a well designed marketing plan, no restaurant can hope to survive in the long term. 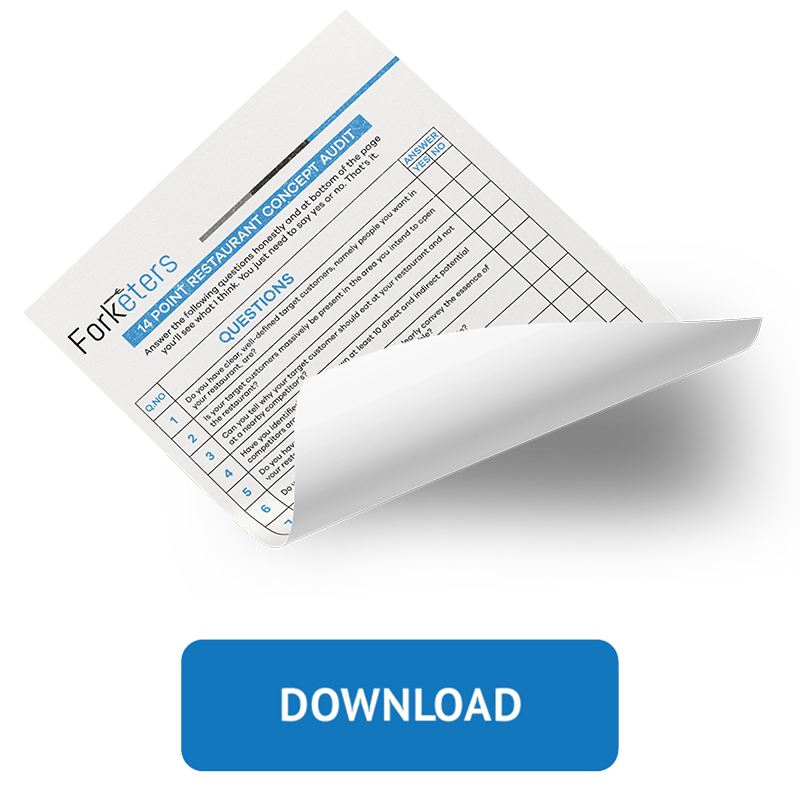 This is a document that both formalizes (according to your Business Strategy), and makes assumptions about, market dynamics – namely objectives, resources and actions towards the target market. It is a written document, included in your Business Plan, containing the analysis of the scenario along with marketing goals and strategies, together with an action plan. The three basic components (objectives, strategies and resources) are the foundation and an indispensable part of the Marketing Plan. Bear in mind that these three components are independent from research carried out on competitors and target customers. Any decisions relating to these are the logical consequence of the results derived from investigations. In marketing you go through both a strategic, and an operational, phase. The former relates to decisions which have a long term impact on your business. Conversely, in the operational phase, decisions are directed towards identifying the most appropriate tools and marketing techniques. A Marketing Plan is a written document by which you list sales, short-term objectives, strategies and the actions to be taken. It is not a general administrative task, as it requires in-depth study. A good marketing strategy is a must. Pro Alto Software will help you develop a winning plan for your restaurant by implementing your ideas, and also check your results. Expert advice is built into the software, to guide you through crafting your plan and putting your campaigns into motion. Great marketing is more than just having good ideas. You should get the right message to the right people at the right time. With this great marketing plan software, you can create both projections and budgets as well as track your performance. At times you may have to ‘sell’ your Restaurant Marketing Plan to someone else, such as a potential investor. Pro Alto Software will allow you to easily create an impressive presentation(s) that will win their support. It can be a product, or a product line (Product Marketing Plan). It can be applied to an existing product, or a new one. Example: A Marketing Plan for the launch of the new McChicken. It can be the Restaurant itself. Example: A Marketing Plan for the opening of the new Restaurant. Once you’ve identified the objective(s) of your plan, prior to commencing the research process, you must clearly define the geographical area to be considered (district, whole city, region etc.) and the duration of the plan (weeks, months or years). The Marketing Plan should begin with an exploratory research into the current situation of the subject analysis. This is done via internal analysis (the internal aspects) and external analysis (the aspects of the environment). At this stage you should reflect on the information relevant to the current situation, its evolution in recent years, and future probabilities. Secondary sources: A lot of interesting information is usually collected via statistics, reference to previous studies, or research. Group Interviews: These can reveal very relevant and high quality information, enabling a SWOT analysis to be conducted, and to highlight some of the above variables which can be later included in a questionnaire – which will generate quantitative information. You should hire an agency for this. Observation of aspects relevant to the investigation: For example, from a visit to the restaurant (if you have done this) or those of your competitor. Once you have obtained the necessary information, the next step is to go for a brainstorming session with the individuals involved in your restaurant business. Here, you should all reflect together on both the positive, and negative, factors. Threats: Any factors that may affect your position regarding competition, or the ability to achieve your goals. Opportunities: Those environmental factors that can positively influence your position as a competitor, and the achievement of your goals. Weaknesses: Those characteristics attributed to the object of analysis, which can negatively affect your position as a competitor. Strengths: Those characteristics attributed to the object of analysis, which may improve your position as a competitor. This diagnosis is often presented in a document known as as SWOT matrix, whereby you list, clearly and concisely, the main threats, opportunities, weaknesses and strengths identified in the Strategic Analysis. The process of Strategic Planning requires the involvement of restaurant managers and owners, whereby decisions are made related to the future of the object analysis. An important point to remember is, when listing your objectives, you should indicate what you want, how you want it, and when you want to get it. What are you going to do?When are you going to do it?Who is going to do it?How much is will it cost? Once you have determined what you want to achieve, when you want to achieve it, and how, it’s time to write your restaurant marketing plan. There is no mandatory structure. However, the plan must be as clear and easy to manage as possible, because it is not going to be an administrative form, but a document to guide future managers. For this reason, there is an optimum on volume. So the rule for determining the size of the plan is simply to make it long enough to contain everything the reader needs to know, yet short enough to avoid irrelevant data. It is highly recommended to have an homogenous writing style, interspersed with effective graphics and images, to make it more attractive. Those types of general and specific Marketing Strategies you intend to adopt in order to achieve the stated objectives. Here you explain, in practical terms, how you intend to give form to the strategy. This indicates the cost for each action and makes a prediction of the expected results. Explain how you want to monitor the results. I understand how it appears to be a daunting task, but don’t panic! By being clear on the main concepts, and providing yourself with the right software, you really have nothing to fear.